Husband was hungry and I brought this to the table. He devoured it. Super simple recipe under $5. I picked up a ton of veggies at the cute little family farm stand up the street from our house and the green pepper needed to be used ASAP. I decided to whip up an afternoon snack for the hubby. We love poutine and had been saying how much we were craving a big plate of gravy fries with squeaky cheese. I didn’t have the ingredients for that, but figured why not tweak the traditional recipe and get our fix…It turned out great! Bake the french fries until crispy. Saute the green pepper with olive oil and a little sea salt. Pour the gravy over the top of the cooked peppers. Once the gravy begins to boil, toss in the cheese bits and stir. 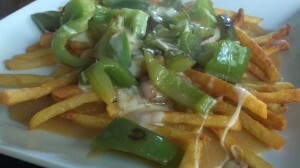 Plate the fries and top with the bubbling gravy, cheese, and peppers.